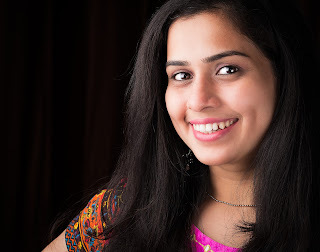 As you know we are celebrating 'ONLY DIY MONTH' at My Indian Version this July (2015) here is the forth DIY post for you (find previous post's links at end of this tutorial post). 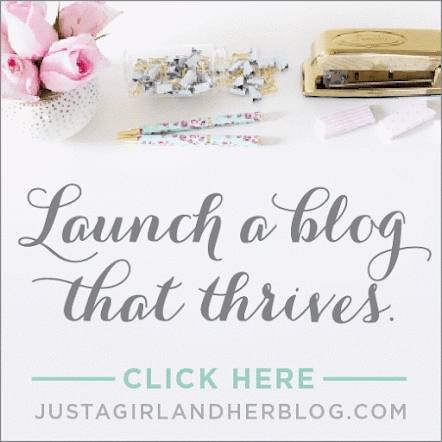 Today I am sharing a DIY home decor + DIY upcycling idea with you. We all have one or the other empty bottles lying in some corner of the house. We keep them because they have beautiful and attractive shapes and colors. But we don't know how to use or REUSE them. There are many DIY ideas on Pinterest crafts about reusing empty bottles for decorations. For example, decorative wine bottles are widely used in wedding decorations in many countries! 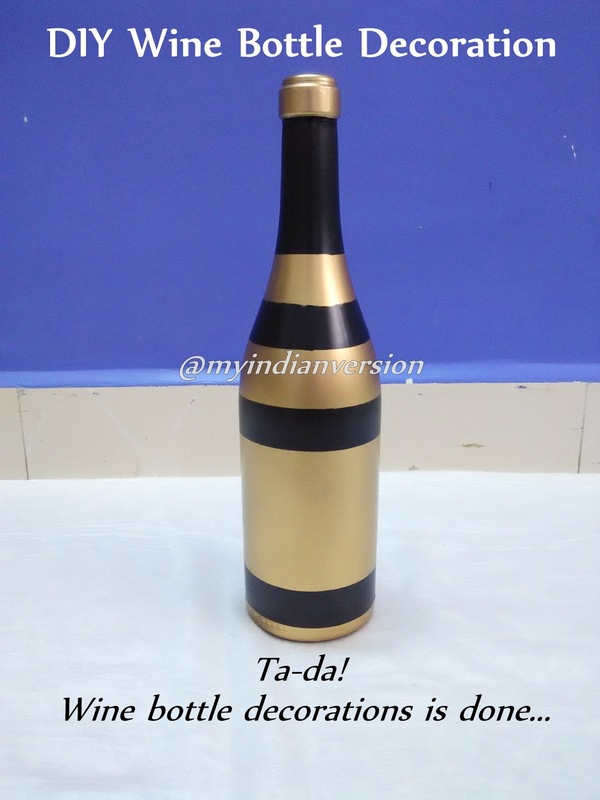 So can't we use these elegant shaped bottles to decorate our home? Yes we can! 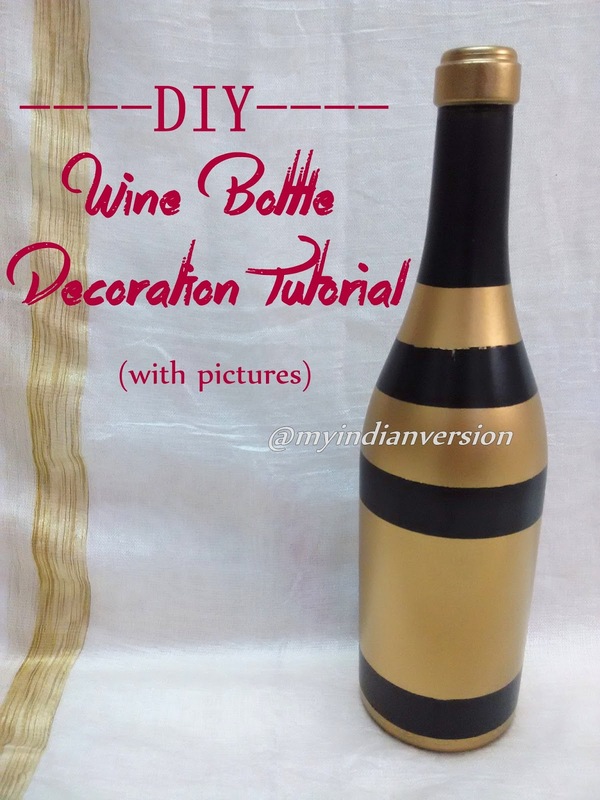 So let us see how to make decorative wine bottle for home decor. 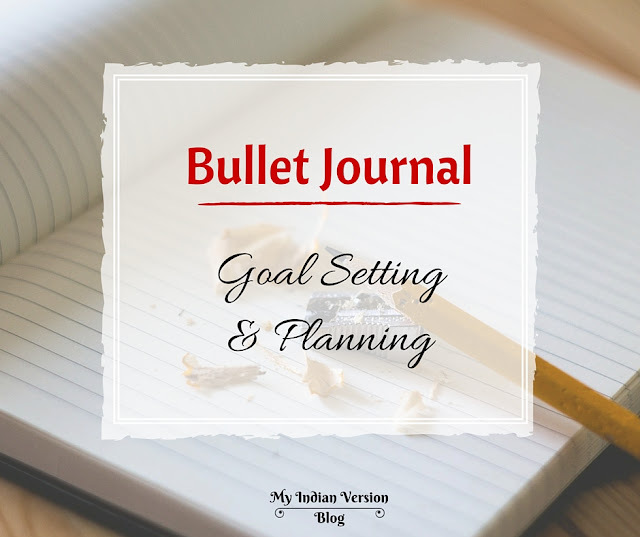 To see more 'ONLY DIY MONTH' celebration's posts go to end of this tutorial to find the links. STEP 1 : If you want whole bottle painted in one color skip this step. Else you want to create design on the bottle then first cover the bottle with masking/ painter's tape in desired design. 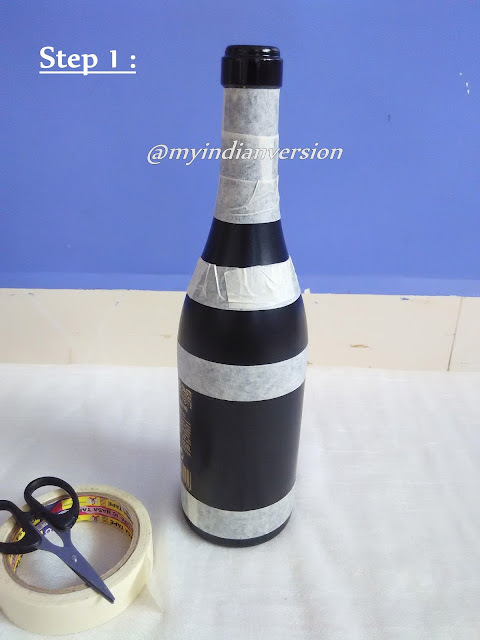 I have covered three broad strips and bottle neck so it will show the original color of the wine bottle in end. 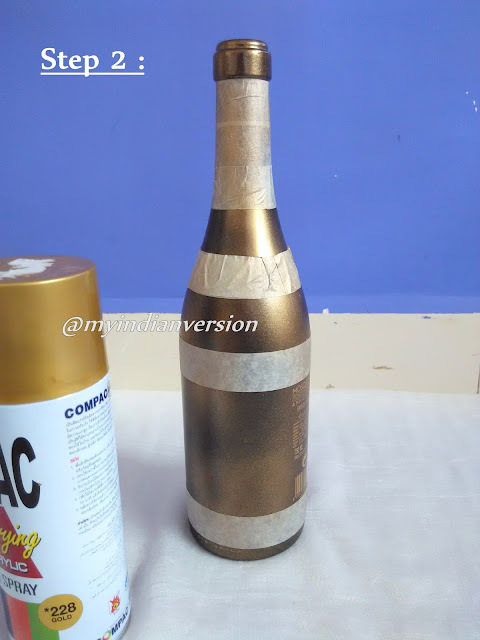 STEP 2 : In well ventilated place start spray painting the bottle. First coat should be very thin. Remember, in first coat don't think of full coverage. We will be applying more coats for full coverage. STEP 3 : Let it dry for 10 - 15 minutes. Then apply another coat of spray paint. Remember that previous coat should dry before applying another coat of paint. Two to three coats are enough to give finished look to the bottle. I have given three coats to my wine bottle. STEP 4 : Let the paint dry. Now remove the masking tape slowly. Ta-Da!! Wine bottle is ready to reuse. With only spray painting the wine bottle is looking so artistic. You can also add some embellishments to decorate it more. Use any spray paint color of your choice and start DIY Wine Bottle Decorations. 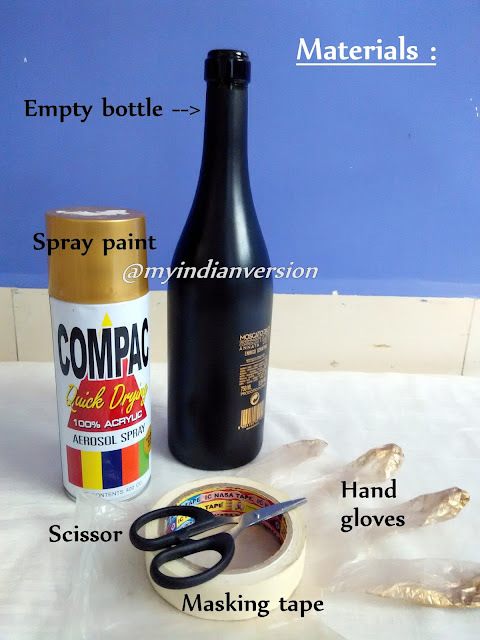 Click a photo of your DIY spray painted bottle decoration and share it with me on my (My Indian Version’s) Google+ and Facebook pages. You can also follow me on Pinterest for new updates and many more interesting DIY ideas.